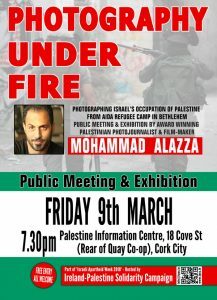 As part of Israeli Apartheid Week 2018, on Tuesday 6th March the Ireland-Palestine Solidarity Campaign is honoured to host a public talk and exhibition by award-winning Palestinian photojournalist and film-maker Mohammad Alazza from Aida refugee camp. The talk will take place at 7pm in Wynn’s Hotel, Lower Abbey Street, Dublin 1. Come along to hear firsthand from someone who reports from the frontline of the Israeli occupation. What does it mean to be a photographer rooted in community, especially when that community is a Palestinian refugee camp? Mohammad Al-Azza, who teaches youth about photography and documentary production in the Lajee Center where he began his own work as a photographer, discusses the challenges journalists face in the midst of demonstrations and clashes. He presents photographs from three different exhibits he produced in Aida Camp, one of which is his arrest and injury to the face. His work highlights the challenges facing the Palestinian refugee community, specifically in Bethlehem’s Aida camp, due to poverty and intense military presence. His work also celebrates the vitality of this community. Hosted by the Cork branch of the Ireland-Palestine Solidarity Campaign as part of Israeli Apartheid Week 2018. For more Israeli Apartheid Week events, see here.